This had been a pretty sleepy summer. I spent more time with my two boys for which I am eternally grateful but I feel I have lost a bit of my edge in the process. Daddy brain they call it. The thought of getting clever and deep in the audio realm seemed a touch out of grasp. 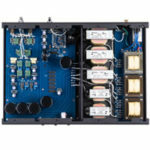 Perhaps my review of the Rogers PA-1A phono preamp took a little out of me. Great product to write about but the summer heat took over and cast a slight pall of laziness around the old Petan household. Perhaps fall would whisk in winds of change and my pilot light would fire up again. 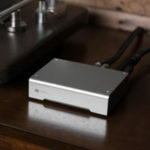 One thing was for certain, I was not counting on the D’Agostino Master Audio Systems Momentum Integrated amplifier falling into my lap for a prolonged run around the block. Arriving in a hearty metal flight case, the packaging is what one should expect at this level. It really could not be any more straightforward getting the Momentum Integrated set up and playing. Simply screw in the cone shaped feet and stack the chassis on top of the power supply, attach the umbilical and power cord, plug it in and off you go. “God this thing is gorgeous;” you will mumble to your self after the brief set up. Gleaming blocks of diamond etched aircraft aluminum and some mad, cool looking copper slabs come together in encasing the watch bezel-like volume meter that looks more horological than audio. The meter mechanism is in full view front and center and really looks like a tourbillon, a device invented by Abraham-Louis Breguet in 1795 in order to deal with the earth’s gravitational pull on the mechanics of a watch. Still being mastered today, a tourbillon watch can start at $200k and head towards a million very easily. You thought high-end audio was expensive! What is really beyond slick is the VOLUME knob that rotates around the bezel of the volume meter. The mechanism is so smooth with just the right amount of knob feed back. The front panel of the D’Agostino Master Audio Systems Momentum has six buttons named for every type of popular gizmo one may plug into it. And that copper is not just for show. They conduct heat three times more efficiently than steel or aluminum. This efficiency has allowed for the Momentum’s sturdy, but compact silhouette. Only providing for six XLR terminated connections, one must get plug converters to accommodate RCA terminated cables. On the right side of the front panels you find BASS and TREBLE controls. You read that right, BASS and TREBLE controls! The knobs are machined into a complex bolt-like shape. Each adjustment is met with a hearty thud, again great mechanical knob feel. From the circular remote there is BALANCE control, POLARITY control, TONE control, POWER, MUTE and INPUT. I have not determined how sensitive the finish is, I have been polishing it every couple of days with a dry cloth just enough to remove fingerprints. There is a HT pass through input with unity gain. I only wish it was offered with a phono preamp. I hear one is in the works. The D’Agostino Master Audio Systems Momentum is nearly a Momentum Preamp And Stereo Amp in one chassis. 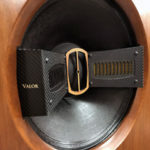 They share a great deal of circuitry and at 200 watts on tap into 8 ohms, 400 into 4 ohms and 800 watts into 2 ohms it sounds every bit as powerful and then some. The separate power supply is machined from a solid block of aluminum, allowing for extreme physical and electro-mechanical integrity. The Momentum Integrated is also available in a stunning Black finish as well. For all the technical info available, please see D’Agostinoinc.com. I am very familiar with Dan D’Agostino’s work. I date back to the KSA 150 amplifier and then the X32, and a X64 DAC. I also had the KPS 20i, KPS 25 CD players, a FPB 300 and FPB 600 amplifiers. Throw in a few preamps and I guess you could say I have a clear view into Dan’s past perspective on audio. 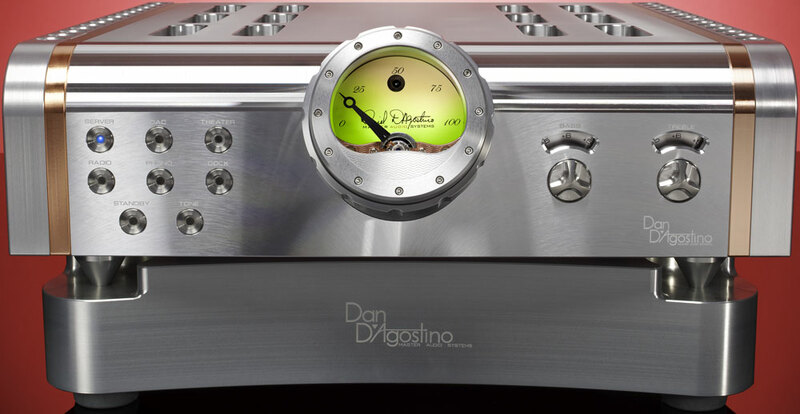 After being in possession of the D’Agostino Master Audio Systems Momentum Integrated amplifier for about two weeks, it dawned on me like a ton of bricks that it was time to start writing about this $45,000 gem from Dan D’Agostino Master Audio Systems. I typically would live with a component a bit longer before delving into the formal review. In this case the Momentum Integrated makes such an impression, such a compelling case for its singular superiority, I just had to get down to business. Listening to Rush Moving Pictures, YYZ and Limelight were enough to get me off my mental couch, clear out the cob webs and let as many of you know as possible, what this magnificent piece of industrial art is capable of on every level. I’ll start with the bottom line right up front. This thing is just killer. There is an absence of any type of distortion tampering with the signal — just pure rich, colorful tone and texture form top to bottom. Starting with the low end, on Limelight from Moving Pictures, Geddy Lee’s bass has such grip, such well resolved texture without compromising dynamic slam, like sledgehammers pounding you with both brutality and poise. Skrillex’s “Coast is Clear” from Recess possesses some of the scariest deep bass ever recorded and the D’Agostino Master Audio Systems Momentum remained unflappable. I have rarely heard the Lansche 4.1 speakers sound this rock solid and extended in the bass. “Show Me How to Live” from Audioslave’s self titled album just slithers and twists its way to audio nirvana. This track really does make its way to the monkey brain and flat out rocks. The level of composure the Momentum Integrated allows amongst the chaos is superb and offers complete confidence in the presentation. I tend not to listen to a ton of audiophile recording so most of my impressions spring from recordings I am deeply committed to for the musical content rather than the audiophile parlor tricks. For instance, Black Sabbath’s Heaven and Hell sprang to life with impact and above all, mid bass clarity, giving the otherwise boxy sounding bass line a sense of texture and focus, clearing away so much of the hollow coloration that normally plagues this recording. Mid-bass notes are not defined through the D’Agostino Master Audio Systems Momentum by any type of euphony, coloration or over-emphasis. 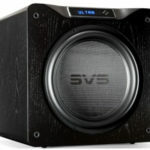 Simply tone, texture, transient accuracy and dynamic shading takes over and squeezes out the distortion leaving the easiest-to-follow bass lines I have yet heard. Moving up the frequency ladder, the lack of distortion is on display with David Ostrika playing Mozart’s Scottish Fantasy on Classic Records CD via a streamer — you will be hearing a great deal about it soon, the notes despite being a tad shrill never jumped off the stage and slap you in the ear. The lack of distortion allowed the slight shrillness of the recording to simply come and go with little emphasis allowing one to sink deeper into the illusion. Ultimately, great music simply becomes greater through the Momentum Integrated. I know this is purely subjective but I hate the look of this amp, to the point where I could not purchase it. Reminds of something from the 1927 film Metropolis by Fritz Lang. I’m sure are those who think it’s the best thing since sliced bread to counteract my opinion though. I can see how the look could be polarizing. I think seeing it in person is a different experience. Maybe not enough to change a mind, but it much more impressive in the flesh. Greg, now that you reviewed 2 of the 3 ’21st century’ Solid State Amps that present what I call ‘Dimensional Sound-staging’. (You describe this DS effect efficiently in your review) I think it’s time for you and Dagogo to review the real world priced $2K Sony TA-A1ES integrated amp. I found the Sony TA-A1ES also does this Dimensional Sound-staging thing … all at 1/20th the price! It presents realistic imaging that IME was reserved for owners of world class SET amps & high-efficient speakers. As a lucky long time owner of a Kondo Ongaku, arguably one of finest integrated amps on the planet, I finally found ‘something special’ that my real world friends can afford to own. While the TA1ES sound great right out of the box, it really shines after 400 hours. A world class source with balanced outputs really allows the A1Es to strut it stuff. The obvious matching Sony HAP-Z1ES music server also delivering bag for the buck. While I’ve never been a Sony fanboy or solid state amp man for that matter … after 50 years of waiting … it’s about time!